Jam-making isn't exactly a typical summer activity; you wouldn't pair the smell of freshly-cut grass with the Christmassy smells of fruity, syrupy conserves. But in the middle of summer this year I spent hours in the kitchen boiling pears, apples, plums and blackberries to make jam and chutney as Christmas presents for my friends and family. Talk about early preparation! Of course I've been told I’m mad to plan so far ahead, but I’m the one getting the last laugh: I hear people moaning left right and centre that they haven’t got the dreaded Christmas shopping done, and how they wish they’d done it weeks ago instead of leaving it until the last minute to buy gifts. And don’t you just know when those presents have been bought in the last 48 hours: “Thanks for the... err... lovely electric pencil-sharpener, Aunty”, and it gets put on the shelf where it collects dust for the next decade. 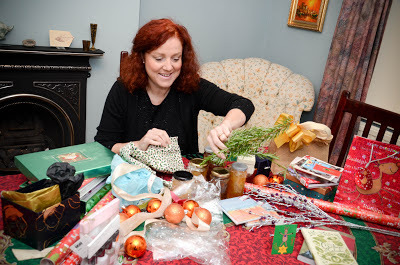 For me, Christmas is about putting that extra bit of thought and feeling into creating something different; my jam has certainly gained a reputation among my friends and family, and I love the thought of people actually looking forward to my gifts. The best part is I spend a lot less money instead of shelling out each Christmas – I reckon I saved about £500 a year since I began making my gifts, which has certainly been helpful during the recession. I’m always on the look-out for ways to save money, rifling through the Christmas cards and wrapping paper during the January sales (at about a quarter of their pre-January price! ), and then stashing them away for the following year. I also make my own decorations – and I’m not talking cut-out snowflakes. I spotted some pine-cones while I was out walking my dog, so I went back the next day, collected a bagful, and then picked up some glitter and glue from an arts-and-crafts store on my way home. After covering the pine cones with a layer of sparkly Christmas frosting, I strung them up around my home with some thread to create some authentic-looking decorations. I must say, you don’t half get a feeling of satisfaction dodging all those ridiculous £5 price-tags on department store baubles. Of course all of this thriftiness does require a bit of forward-thinking. 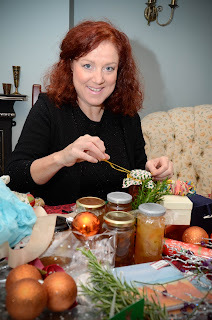 I've been saving up used jars all year for making my Christmas jam, and if you are going to make treats for family and friends, you need to check how long it takes to make them – chutneys can take about three months to mature. Plus, if you can remember to get out a pair of scissors before ripping into your Christmas presents, cutting them open makes it a lot easier to recycle wrapping paper for next year.